Terminology client with easy-to-use interface. Import and export of established terminologies. Multi-lingual options, with full Unicode support. Editing rights subject to authorisation controls. Validation of suggested new terms. Simultaneous control of several systems. System Simulation has had extensive experience in developing terminology and thesaurus systems and has helped many organisations in the cultural sector, in education and in image management to improve consistency and efficiency in their cataloguing and searching. Clients with whom the company has worked in this area include the British Museum, Getty Images, JISC and the Higher Education Academy. This experience has led to the many practical features in our terminology client and also to consultancy that has helped organisations dramatically improve their existing systems. This consultancy extends to assistance in the development of full ontologies or to the design of controls based on ontological structures. 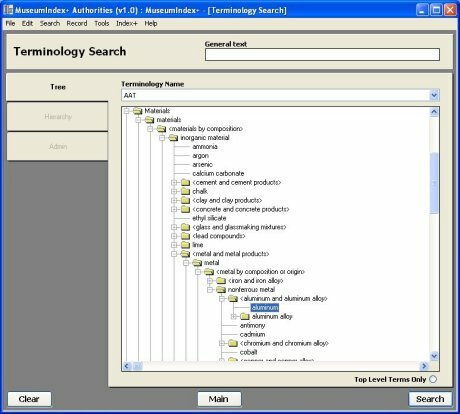 System Simulation's terminology client provides easy-to-use terminology management with multiple, hierarchical term lists and a range of management features. Pre-existing terminology lists can be loaded or lists developed from unstructured terms already in use or, of course, new terminologies can be initiated, based on newly developed ontologies. Terms can be introduced, edited, moved and rearranged easily, allowing the multiple terminology lists to develop quickly. Controls in applications can take the form of drop-down lists or controlled fields that invoke the terminology client to assist in the choice of terms. Authorisation features allow different editing and validation rights to be attributed to different staff. This may include a facility to introduce new terms temporarily, making them subject to subsequent validation. Thesaurus features allow broader terms, scope notes, preferred terms and related terms and supports the development and use of thesauri to BS 5723 (ISO 2788) standards. Users of the thesaurus editor can import standard thesauri such as the BSI Root thesaurus and then develop them further to meet their particular requirements. The thesaurus provides a means of enforcing a controlled vocabulary in certain fields during data input as well as being an aid for searching. When searching, the thesaurus offers broader, narrower or related terms in order to refine a query. Multi-lingual features in our thesaurus system mean that data output can be in multiple language versions and full Unicode support extends this to the character sets of a wide variety of non-European languages. Index+ Terminology can also support multiple systems simultaneously, ensuring consistency of data across different applications. Well-structured terminology and thesaurus systems can also be used to great effect to illustrate relationships within data and support novel approaches to searching. System Simulation has experimented with several 'visualisation' systems that present these relationships in diagrammatic form. The package includes perpetual licences, installation, a 90 day warranty, documentation and training. Support, maintenance and ESCROW arrangements can be agreed.